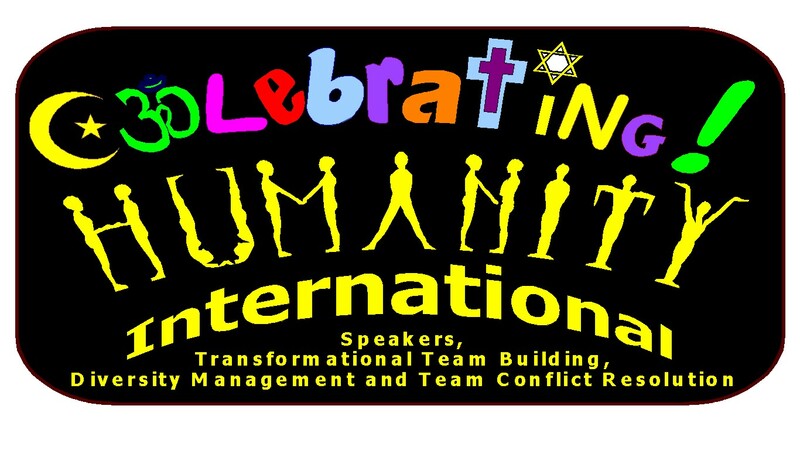 Celebrating Humanity Team conflict resolution programs remove conflict from teams, through celebration, agreements, clearing and individual accountability. From a Sales Managers point of view on the training program Celebrating Humanity I found that as a head of department in the Sales division it was certainly beneficial to my whole team. I have noticed that their attitude towards one another and to their work has improved remarkably. There is a sense of urgency, motivation and commitment to evaluate a situation before making a decision on certain aspects of their job functions. The Teambuilding: This was interesting and informative and gave me a different view on my staff I thought that I knew them all regarding their habits and what they did in their everyday activities both at work and on the home front “was I surprised” each individual had similar concerns which was not too much of a issue but had not been voiced in as much detail .This is where the trust and transparency filtered through even more that ever. I am perceived as an honest and trustworthy member in my department and this was nice to know that we collectively were brought closer together in sharing our views as a Team rather than individuals. Methodologies: The methodologies that were applied in achieving the interaction between on another were how I shall say “INTERESTING”. It reminds me of the old saying Back To Basics how true this is, a simple good morning how are you, and how your weekend was is a great opener in any conversation followed with a Smile. For one to have the courage and trust in revealing ones personal problems, concerns, and even thoughts on a particular issue is normally a tedious extracting process, not the case when face to face as the exercise revealed where we say opposite one another and reveled our thought and concerns one felt almost obliged to spill all. The perception that I had of some of the staff “in other departments “was misconstrued. I found them to be transparent and almost enthusiastic to tell me everything they possibly could in the short space of time that we had. Ability to work with different cultures: This is an area that needs lots of work; it’s too easy to assume that people must answer you back in your home language. I need to take the time to learn the ways and cultures of those we interact with on a day to day basis.Just the basics will be a huge stepping stone forward, too often one feels not so much as embarrassed but more “not informed “well enough to attempt a simple SAWUBONA as an example to someone that we see on a day to day basis .We slip into our comfort zone and use our own native language. The body language I found interesting and different in each culture that I encountered as well. Conclusion: Anyone that is willing to change for the better, the company and in the way they approach life in general will be pleasantly surprised of the outcome of this program. It has given me a different prospective on my staff and a better understanding of how they feel. The “buy in” from all has been fantastic and in particular an approach on how to “fix “issues is a joint venture between ourselves as “A Team”. The interaction with other department is much more “transparent”. A huge stepping stone in the right direction. Brian Moore talks to David Greenberg on how he has built business and relationships, internationally. Presenting to people with differing learning and communication styles. 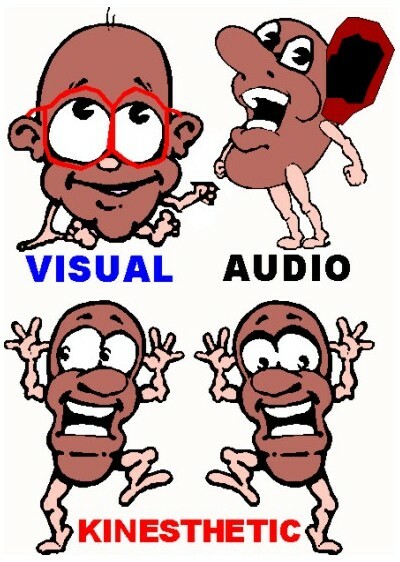 Presentations often are very Auditory, strongly Visual or a combination of the two. Although the latter is better than the first presentation style – a number of people will not participate fully, nor will they be inspired and involved. An Auditory presenter/ facilitator will often use wordy presentations, or flip chart statements to make their point. You will know that they are strong auditory communicators by the cleverness of their words, their stories and examples and the fact that they flip over the pages of their presentations/ flip chart pages once they have spoken of them. They may be asked to “go back” to previous pages/ slides by visual learners. a) Bore visual learners with long-winded explanations. b) Isolate Kinesthetic (experiential) learners by not physically involving them. A Visual presenter will use visuals as much as they can. Some will be very detailed and intricate. They will normally display each visual/ flip chart on the walls, as they finish with it. This ensures that there is a long term reference for audience members. Their explanations are often brief and to the point, and they expect people to understand – from the graphic nature of presentation. Kinesthetic presenters will often get an example/ sample of the item under discussion, into the hands of the audience members. This ensures that they can touch, feel and experience it. Their words will have to do with the feel and experience. b) Isolate Visual Learners by not visually involving them. The most important part of a strong presentation is to make sure that there is a “mixed grill” in terms of presentation styles. 12 steps to great presentations. Presentations are verbal, sensory, visual and experiential. We must ensure that delegates have the opportunity to feel, hear, discuss, think, see, experience and intellectualise the lessons and information in the presentations. 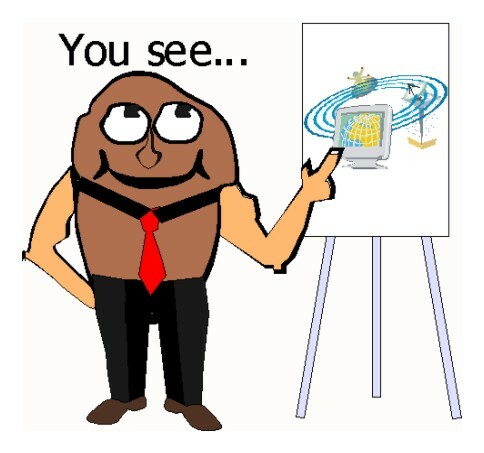 2) Have visual descriptions using colour words and audio pictures of place and things . 3) Have heart and sensory words. 4) Have power words, stories, sayings and examples. 5) Ask feeling, seeing and hearing questions. How do you feel? Can you see what I am showing you? Do you hear/ understand the process thus far? 8) And numbered steps to using a product, with step-by-step outcomes. 9) These must be allied to visual media, graphics and pictures. 10) Actual examples, samples and working models should be distributed around the room, so that those who like to experiment can do so. 11)Copies of the slide show should either be handed out, or displayed on the walls. Anything written, or drawn on a flipchart page should be stuck around the room, on the walls – in order of presentation. 12)Time should be taken for interaction, discussions and for prodding, touching and experimenting with models, samples and examples. This will allow for an active question and answer session. 13)There should always be an element of fun in any presentation. In this way, everybody is involved. They will all feel as if you are presenting directly to them. How your learning style affects your relationships and how you can get better results, yourself and with others. Now that we know that we have a unique learning style, it is important to note that – as a result of that style – we also have unique ways of interacting, communicating, listening and behaving. This impacts our relationships and our ability to build relationships with others. Their inability to listen to an extended auditory presentation, or conversation. Their habit of giving their answers, to other people’s problems, before they fully understand the challenge. The speed with which they speak – this comes from the need to share “their picture” – in words. As pictures are formed immediately and words only come out one at a time, this slows down their ability to communicate – hence their need for verbal speed. Their impatience with long speeches from Auditory learners and the time taken by Kinesthetic learners – when answering a question. What to do when communicating with a visual learner. Demonstrating, showing or sharing with them through pictures, diagrams, maps and written instructions – with diagrams, graphics or pictures. Using landmarks, visual and picture words. Being concise and brief with your words, descriptions and conversations. Use emails with an opening overview paragraph – just like a newspaper column. In this way the auditory and visual learners can quickly see if it is relevant to them to go to the next paragraphs – for additional information. Attach pictures and graphics to the email. Refer to another source/ link for any additional information. They understand fairly easily and simply love to tell their own view of the story – often before you have finished talking. If they think that you don’t, or may not understand – they will tell you the same thing – in many different ways. They invariably start telling you everything – right at the beginning. Don’t stop them – they may start their story again! Their inability to listen. They actually prefer the sound of their own voice and will try to take over the conversation. Their habit of giving their answers, to other people’s problems, before they have fully heard the challenge. They have a story with a moral – often very long – for most situations. They love to impress with their grasp of language and will keep on talking as long as there is a listener (victim) to speak to. They disregard pictures and will get you to “tell” them, everything! What to do when communicating with an Auditory Learner. Give them something written or recorded for them to review in their own time. Use parables, quotations, stories and power words in your descriptions. Use emails with an opening overview paragraph – just like a newspaper column. In this way the auditory and visual learners can quickly see if it is relevant to them to go to the next paragraphs – for additional information. They understand fairly easily “through doing and like to take time to store the experience. 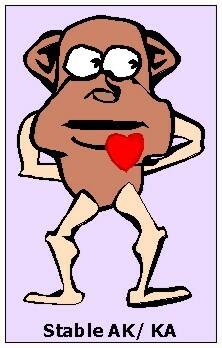 They seldom express their feelings, or input – unless comfortable with the people in the group. As observers, doers and listeners – they are in touch with everything going on around them. The time that they take to come up with an answer to a question. This can put them under a lot of pressure. As they learn dominantly through doing and experience they refer to experiences for answers. This can take some time – and is very frustrating for visual and auditory learners. Visual learners normally pressure them for a “quick” answer and auditory learners will keep on repeating the question in different ways – until they get an answer! 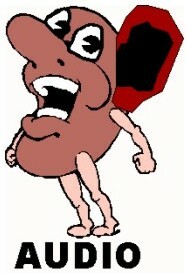 Their inability to speak up – or say “no”, when asked to perform a task or do a favour. Their habit of talking to people they are comfortable with about their problems with other people. This never resolves the issue. What to do when communicating with a Kinesthetic Learner. Make sure you make them feel safe and good about themselves. Let them get hands on experience to ensure long term retention and skills development. Step by step games, plays and movement are keys to transferring knowledge. Use feeling words and warmth in chats and documents. Use emails with an opening overview paragraph – just like a newspaper column. This combination of VA means that you have a person who is good with words, says what they want to and looks for the answers through pictures and words. They have little challenges in communicating, teaching, presenting, or learning – but can be a bit too straightforward, at times. VK – the more visual – the faster the speech and the easier it is for the VK to communicate. KV – The more kinesthetic – the less likely they will speak up when “emotionally” injured. They will most often store their upsets – until they form the basis of an explosion. In the interim they may talk to people they trust and feel safe with. When they finally explode it will come out at loud and at high-speed. Once they have fully revealed their feelings, they will happily move on. They may not remember all of the details of the arguments/ explanations. As long as the big picture is removed from their hearts – they will be happy. When Kinesthetic meets Auditory (AK or KA). 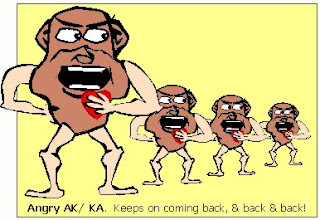 AK – The more Auditory, the more easy it is for an AK to speak up. They will explain and explain the issues – to whosoever will listen – because their “story” runs around in their heads for a long time. 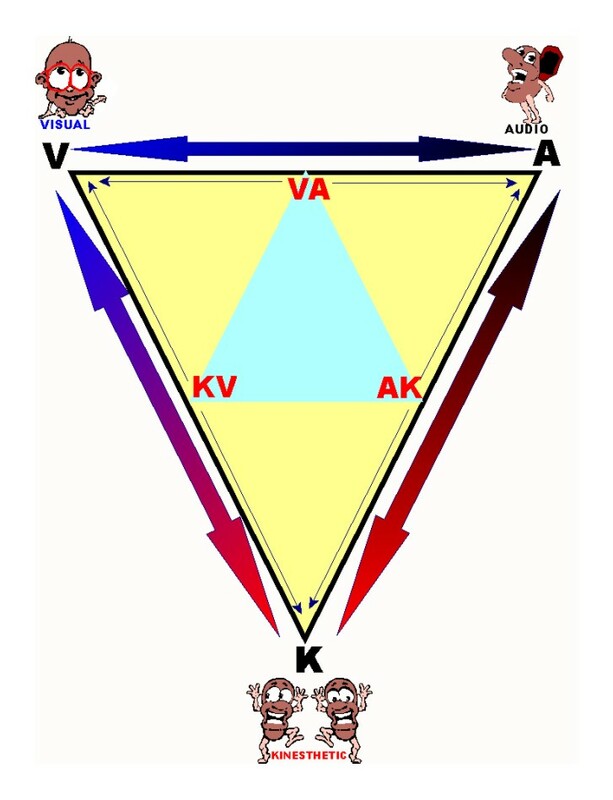 KA – The more Kinesthetic the less easy it is for a KA to move on from a perceived or real emotional “injury.” They too will most often store their upsets – until they form the basis of an explosion. In the interim they may talk to as many people as they can – who they trust and feel safe with. They often go back, again and again until the pain has left their “hurted” heart! And if the person they are angry with raises any other issues the AK/ KA will have many examples of associated stories to justify their anger. Often they feel bad about their behaviour and have to go back and apologise. At this point – do not be surprised if they start giving lots of historical reasons for their behaviour! What we can do to Prevent such Communication disasters. If you are strongly Kinesthetic – it is critical to learn to speak up, when you are not comfortable with the way that you are being treated. 9 times out of 10, this will NOT upset the person you are speaking to. What will hurt them will be the shock explosion, that comes from your own inability to get uncomfortable issues out of the way. Talk clearly, openly and with respect. If you cannot change the situation, or are faced with a perennial abuser – move on. You do not deserve to be stuck in an abusive relationship. Nor do you need to become the abuser – when you are stretched to your emotional limit. 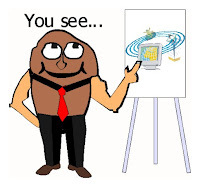 If you are strongly Visual – and/ or Auditory make sure that you listen more carefully. Do not say everything that comes into your mind – without thinking of the human being in front of you. Adjust your tone and attitude, to suit them. 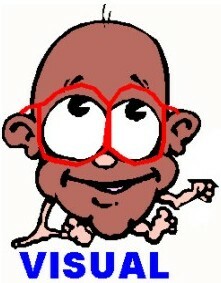 If you are very Auditory – respect the fact that other people are also intelligent. Reduce the number of ways that you use to explain “things.” Ask more questions, listen more and don’t talk so much. Use pictures for the Visual and models for the Kinesthetic learners. Visual Learners may need to use more words, than they want to use – with Auditory learners and exercise patience when waiting for answers from Kinesthetic learners. It always helps if you draw a picture of the conversation (block diagram), to keep your attention focused on the talker and what they have to say. Please comment and add your input. We will be delighted if you share this blog. 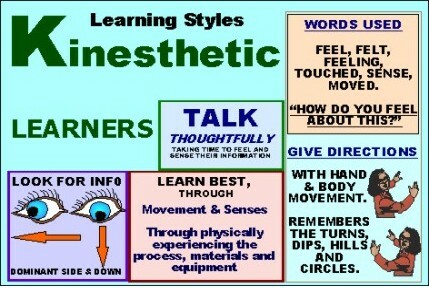 How to Assess Learning Styles. of your family, your child, your child’s teacher, your clients and your friends. Each person’s learning style is unique and perfect, as it is. 1. Speed of speech. How fast, how much, or how thoughtfully they talk. 2. Vocabulary. The words that they use. 3. Directions. How they give directions. 5. Eye Movement. Most importantly – how their eyes move, when they have to think. When we do this we can assess their natural and preferred learning style. This is made up of a combination of learning through seeing, doing, telling and listening. Our dominant learning style, and theirs, normally determines how we communicate. Understanding ourselves and our subject show us how best to teach and to learn – and gives us the keys to communicating concepts, visions, messages and presentations to individuals – and to groups. We all have very unique learning styles, which are made up of varying levels of Visual, Auditory and Kinesthetic learning preferences, however when we find the dominant aspects within a person’s learning style, we can focus more on those. With these keys we are able to take charge of the communication that we share or receive, by making simple adjustments in the way in which we communicate with individuals and groups of people – and by taking charge of the way in which others communicate with us. We all learn through a combination of the 3 basic learning styles. In each of us certain aspects are stronger than others. The basic learning styles are (V) Visual, (A) Auditory, (K) Kinesthetic. Basic combinations are (VA) Visual Auditory, (KV) Kinesthetic Visual and (AK) Auditory Kinesthetic. 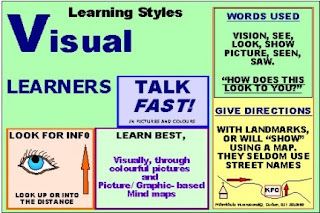 · Visual learners learn, share and receive best through pictures, photographs and visual displays. · Auditory learners learn and receive best through hearing and talking. They share best through words. 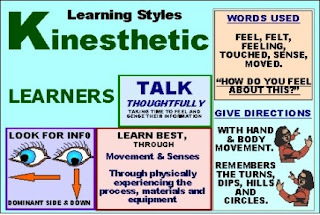 · Kinesthetic learners learn and receive best through doing and experiencing and share best when demonstrating processes and ideas. Results in exams, presentations, sales opportunities. If you wish to communicate better with a person – take charge of the conversation and observe. Ask questions that cause him/her to think. Note: Asking something that they easily have the answer to (like their name) will not reveal any signs. When they answer a question, ask another. Use open questions to get them to think even deeper. (Eg. “Why did you like him?”, “What made you choose that outfit.”). The signs will become more apparent. Ask them for directions from one point to another, in an area that they know reasonably well. Watch the direction of their eye movements, as they reflect upon the answers. Listen to their answers. Note the words they use and the speed of their speech. Observe their hands and body movement. If you are an observer, PLEASE do not answer for the person being assessed. This does not help at all. If you are being assessed – just relax. This is all normal and the knowledge gained will help YOU, in YOUR studies, communication and relationships. Eyes look up, or into the distance, when accessing information and answers to your questions. 4. They use landmarks when giving directions. Road names are not as important to them, unless there is a very visible road sign with the name on it, or it is a major and well known road. Talk a lot and like to dominate conversations they use sound words, with strong emphasis on key words. The words used are – Mission, story, heard, hear, listen, speak, say, whisper, understand, tell and ear. 4. They use road names, traffic lights, circles and T junctions when giving directions. Landmarks are not as important to them, unless it is a national landmark – and even then they will tell you what the sign “says”, on the front of the building. They normally start the directions from where you are parked. Even if you are in another city! Often take their time and talk thoughtfully, whilst moving, holding their hands or fiddling. 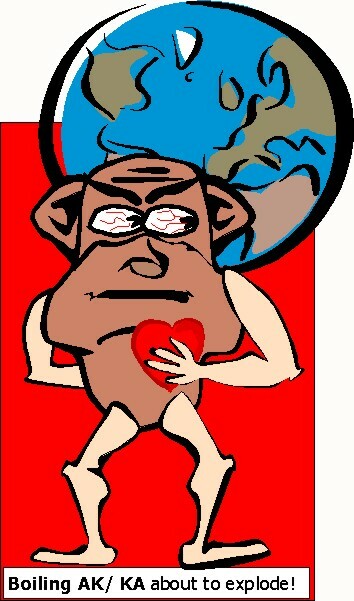 They use emotive words, such as – feel, feeling, felt, sensed, moved, cared and safe. 4. They often do not like giving directions and when they do they will talk and show, whilst physically showing the journey, using body and hand movements. 6. In real-life situations – some very kinesthetic people may even jump into your car and take you to your destination! 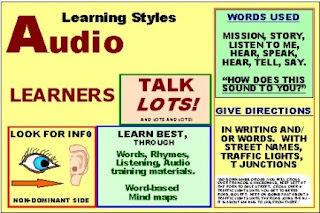 Once we have these signs for the basic learning styles it is important to look for other signs that show the various dominant combinations. These are Audio Kinesthetic, Visual Kinesthetic and Audi Visual. The more someone leans towards one of Visual, Audio or Kinesthetic the more dominant that aspect becomes and the less dominant the other aspect will be. Glance from left to right – and to their hands, when accessing information and answers to your questions. 2. Normally only talk a lot when comfortable and can at times take time and be reserved – thoughtful. They use sound and emotive words. 4. They use road names, traffic lights, circles and T junctions and body/ hand movement – when giving directions. 5. The more audio – the more talkative they are. 6. 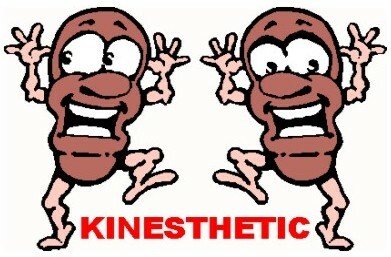 The more kinesthetic – the more reserved and physically expressive they are. Eyes look up, into the distance and glance occasionally to the ear on the non-dominant side, when accessing information and finding answers to your questions. 2. Often talk well with power words using auditory and visually descriptive words, including colours and power words. 4. They use landmarks, road names, traffic lights, circles and T junctions when giving directions. 5. They find it easy to learn and communicate. Eyes look up, or into the distance and towards the ear on the dominant side and to their, when accessing information and finding answers to your questions. 2. Sometimes talk fast – when comfortable – and at other times are more reflective and thoughtful. They use emotive and visually descriptive words. 4. They use landmarks and physical body movement, when giving directions. 5. The more visual – the more landmarks and openness, to give directions and talk or show. 6. The more kinesthetic – the more thoughtful and reflective – and the more their body and hands will move.